Spring recipes from Seasonal Berries. Full of fresh, colourful and delicious spring ingredients. 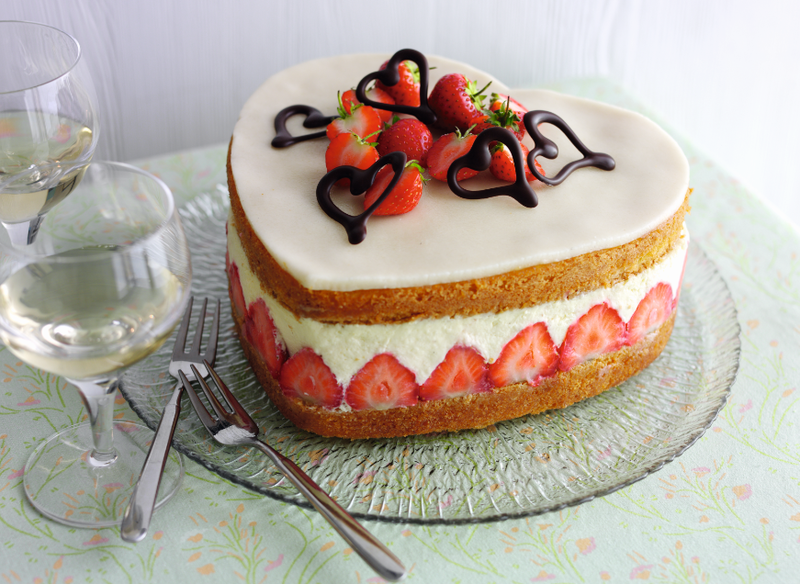 Wow the special person in your life with this impressive looking cake, this classic French recipe has a few short cuts, so you don’t need to be a master baker to make this version! Cook’s tipNot a fan of marzipan then simply leave it out and spread the top of the cake with melted chocolate or simply dust with sifted icing sugar instead. Preheat the oven to 200°C (180°C fan) Gas 6. Heat the oil in a frying pan, season the fat on the lamb with salt and pepper then fry, fat side downwards in the pan for 4-5 minutes until golden. Add the lamb and pan juices to a roasting tin and spread the fat with the honey. Roast for 15 minutes. Mix the herbs together then spoon 2 tablespoons into a bowl for the sauce, sprinkle half the remaining herbs over the lamb, keep the rest for the salad. Roast the lamb for 5 more minutes. Meanwhile cook the potatoes in a saucepan of boiling water for 15 minutes until just tender, adding the peas for the last 5 minutes. Transfer the lamb to a serving plate, cover with foil and leave to rest for 5 minutes. To make the sauce, add the blackberries, vinegar, mustard, honey and stock to the roasting tin. Bring to the boil, scraping up the pan juices and mashing some of the blackberries to release their juice. Boil for 2 minutes then add the reserved 2 tablespoons of chopped herbs and a little extra salt and pepper to taste. . Drain the potatoes and peas, dry the pan and heat the oil then gently fry the fennel for 2-3 minutes until just softened. Add the butter, the cooked potatoes and peas, and toss together in the butter. Add the blackberries, rocket and remaining chopped herbs with a extra salt and pepper and toss together. Spoon the salad into a serving bowl. Reheat the sauce if needed and pour into a jug. 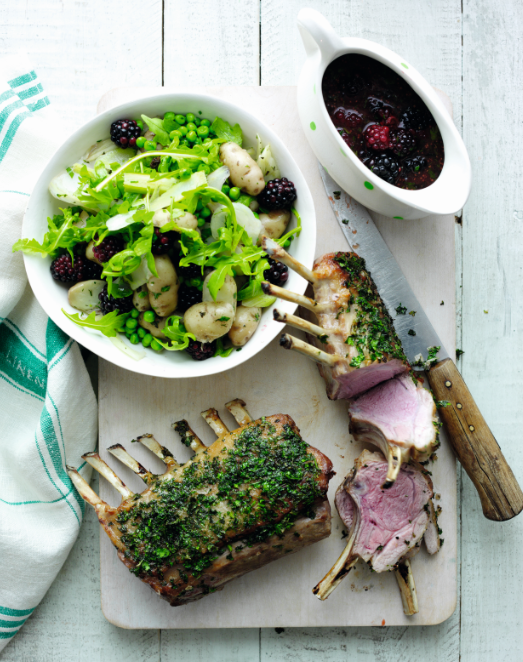 Transfer the lamb to a chopping board and cut into cutlets, serve with the salad and sauce. If you prefer your lamb well done, then roast for 5-10 minutes more before adding the herbs. 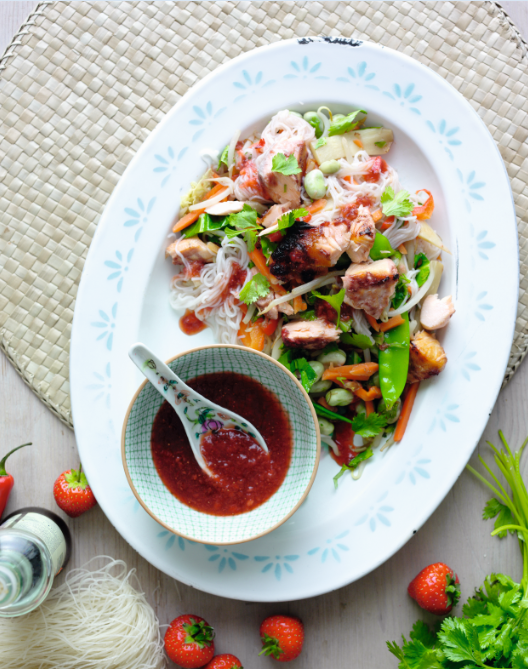 Incredibly versatile, strawberries taste great added to sweet chilli dipping sauce, with extra chilli and ginger for an oriental twist. Mash the strawberries in a bowl then mix with the chilli and ginger then stir in the dipping sauce, soy and fish sauces. Line the grill rack with foil then put the salmon steaks on top and spoon about 1 tablespoon of the strawberry sauce over each salmon steak. Grill for 8-10 minutes, turning over once until browned and the strawberries have made a deep coloured glaze. Meanwhile add the rice noodles to a saucepan of boiling water and cook for 2-3 minutes until just tender, then drain. Heat the oil in a wok or frying pan, add the stir fry vegetables and frozen edamame beans, stir fry for 2-3 minutes. Stir in half of the strawberry sauce then add the noodles and cook for 1 minute. Add the remaining strawberry sauce to a small bowl, set this on a large platter, stir half the coriander into the noodles then spoon on to the platter. Break the salmon into large flakes, scatter over the noodles with the remaining coriander. Serve with lime wedges, if liked. For steak fans, cut a grilled steak into thin slices and add to the noodles instead of the salmon flakes.